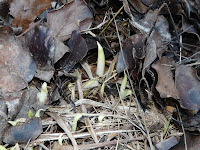 I've been out in the garden a lot over the past few days, moving things around, cleaning up, and I've been noticing some signs of spring. I sold my first order of moss mousse yesterday, and I took a picture of what goes in the envelope before I packed it all. 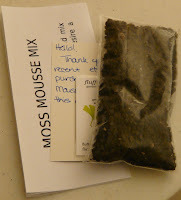 As you can see, there's the sealed packet of moss mousse, a business card, a thank you note, and a page of instructions on how to use the mix. I can't imagine how you make that moss mix. You must have a food processor used just for garden duty.